Ariana Grande has dated famous faces from Big Sean to recent ex Pete Davidson. Find out all of Ariana's ex boyfriends here. At just 25-years-old, Ariana Grande is one of the biggest stars on the planet and it recently emerged that her and recent fiancé Pete Davidson have split just a couple of months after getting engaged. Ariana has had some pretty famous boyfriend's during her time in the spotlight and they have also been famous faces! Let's take a dive into the relationship past of Ariana Grande, from her two year romance with Mac Miller, to her recent engagement to Pete. Back at the beginning of Ariana's singing career in 2012, she started a long distance relationship with Australian YouTuber Jai Brooks- who started a competition with his brother to see who could get her attention, which the singer's mum spotted and told Ariana to message him! They dated for about a year, flying back and forth to surprise each other, but it all ended when he publicly accused the singer of cheating on him with The Wanted singer Nathan Sykes- who she had a song with called 'Almost Is Never Enough', something she has strongly denied, claiming Jai simply wanted 'his fifteen minutes of fame'. They also briefly broke up when Jai surprised Ariana on the set of her music video with Mac Miller (where they spent the entire video kissing), which is slightly awks as they continued on to have a two year relationship *side eyes*. Ariana started dating Big Sean, a rapper signed to Kanye West's music label in 2014 and they made their public debut at the 2015 Grammy's. Their relationship lasted for about 8 months, and they were actually super cute together and performed their songs such as 'Best Mistake' and 'Right There' together on a number of occasions. We do wonder if those songs will ever get performed again or have joined the back catalogues forevermore. The pair supposedly ended because of their busy schedules and neither were upset because 'they remain such good friends'. Hmmm. Big Sean is currently dating 'Post To Be' singer Jhene Aiko, who is pictured here at the 2015 Grammy's alongside Ariana. Awks. Following the end of Ariana's relationship with Big Sean, she briefly dated one of her dancers named Ricky Alvarez. Ricky became one of Ariana's dancers in April 2014 before talk of a relationship between the two was sparked when they kissed on stage during a 2015 live show. Ariana and Ricky dated for just over a year before she tweeted 'life is wild and change is f***ing fantastic' and hinted that the couple's relationship had come to an end. Neither Ariana nor Ricky has spoken out about the reasons behind their split. The couple were caught up in an infamous scandal after they visited a doughnut shop and were filmed secretly licking doughnuts, quickly being slammed by both fans and the press, before issuing a public apology on Twitter. Her longest relationship to date only ended in May 2018 and was with 26-year-old rapper and singer Malcolm James McCormick AKA Mac Miller. They first got together back in 2016 when they collaborated on track 'The Way' and went public soon after in a classic celeb way, with Ariana appearing on Ellen. Mac supported Ariana after the Manchester attacks in 2017 and the couple were still together when Ari released 'No Tears Left To Cry' and performed it at Coachella back in April 2018. 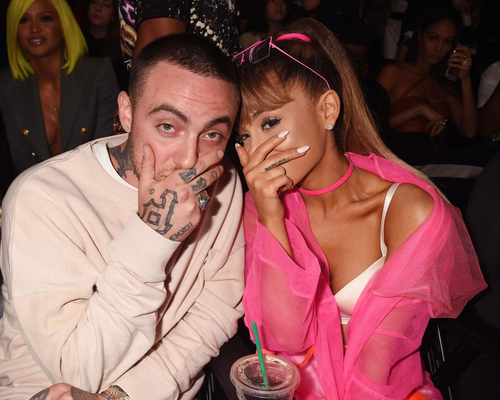 Fans were shocked when the pair ended, but Ariana quickly explained how she couldn't date a man "who couldn't keep his sh*t together" and struggled with his sobriety- Mac was arrested after totalling his car whilst driving drunk days after their split was announced. They were a couple for just under two years, but tragically Mac Miller passed away in September 2018 after a reported overdose. 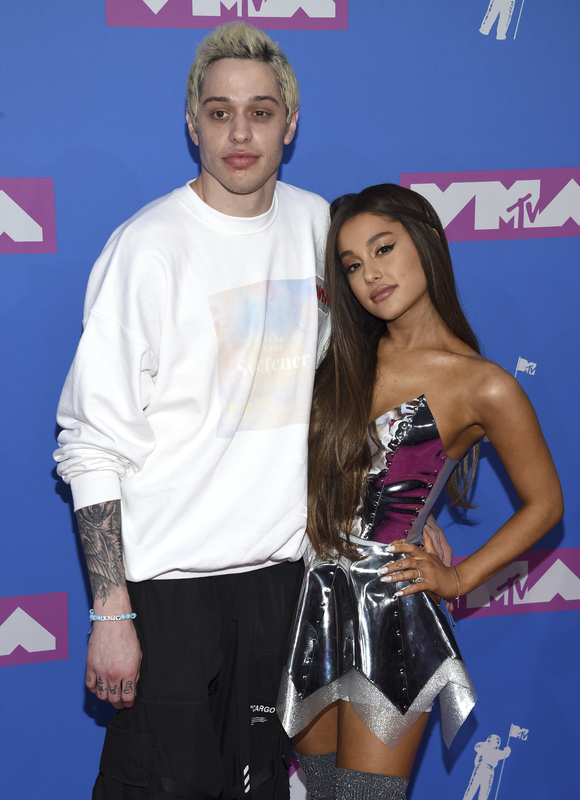 In what had been a total whirlwind romance, SNL comedian/actor Pete Davidson and Ariana got together seemingly out the blue and quickly became inseparable before confirming their engagament just weeks after getting together. However, after a few months of being engaged, Ariana and Pete split and Pete has even deleted his Instagram account fuelling the rumours that it hadn't ended on good terms. It's been suggested that the recent death of Mac Miller and its effect on Ariana played a big part in the couple's split, however that has remained unconfirmed as the pair remain silent on the reasons behind their split.